Madam Quek Pong, 86, has dementia and needs help with even the simplest of daily activities, such as bathing herself or getting out of bed. She gets $300 a month from ElderShield, which helps her family pay for necessities such as her special diet and her live-in helper. But the rest of her expenses - about $900 a month - are paid for by her nine children. 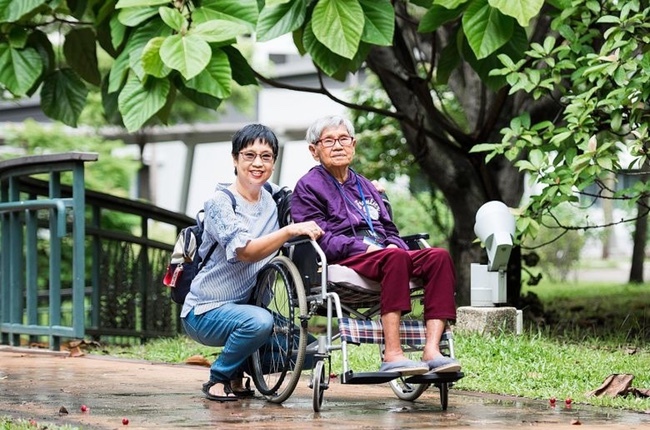 From 2020, severely disabled Singaporeans such as Madam Quek and permanent residents with similar conditions can draw up to $200 in cash from their Medisave accounts every month to pay for such necessities. It is the first time the Government has allowed cash withdrawals from Medisave since the scheme was set up in 1984. The move is to give people greater flexibility when making their care arrangements, which is important when "the needs are quite diverse", Health Minister Gan Kim Yong said yesterday when he announced the scheme. "Some of them may have an informal care arrangement and need some financial support to make sure this is affordable," Mr Gan said. "So, by giving them cash, it will give them greater flexibility." He added that it will not result in higher Medisave contributions. Severely disabled people aged 30 and older can withdraw the cash from either their own or their spouse's Medisave accounts. The maximum amount they can draw every month ranges from $50 to $200, and depends on their Medisave balance. For example, a person with at least $20,000 in his Medisave account would be able to draw $200 every month. If this amount drops to $15,000, he would be able to draw only $150 a month. Should the account have less than $5,000, then no cash can be taken out of Medisave. This is to ensure that the account holder still has money to pay for other healthcare needs, such as hospital bills or MediShield Life premiums. For now, the Health Ministry plans to let only spouses tap each other's Medisave funds in this manner, Mr Gan said. The ministry, however, may allow people to tap their parents' or children's Medisave funds on a case-by-case basis. "Primarily, we still want to make sure that... each generation's Medisave is sufficient for their own use, rather than to have an inter-generational subsidy," he said. "But we will be flexible." The ministry said that nearly half the Singapore residents aged 65 and older have at least $20,000 in their Medisave accounts, while about a quarter have $5,000 or less. It added that the median Medisave balance for this age group is $19,000. Madam Sarah Liew, one of Madam Quek's children, said the move showed foresight. "It is all right for us because my mother has so many children," she said. "But in future, people won't have so many children. It is better to be prepared and self-sufficient." Ms Janice Chia, who is managing director of Ageing Asia, welcomed the move to allow Medisave withdrawals in cash for the severely disabled. However, she added that the Government could consider a similar move for people who have mild or moderate disabilities, and still require a caregiver for one or two daily living activities. "Perhaps we can consider a tiered-level payout depending on how much the person is able to live independently," she said. She added that this extra sum could potentially help people access rehabilitation services that could reduce the chances of severe disability.